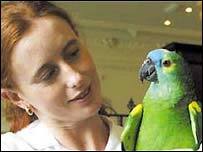 A feathered attraction at a County Durham Hotel is retiring after 17 years of chattering to customers. Albert the parrot had hundreds of members in a worldwide fan club founded for visitors to his home at Walworth Castle Hotel in Darlington. Chris Swaine, who owns the 12th Century hotel, had set up e-mail, and given Albert a homepage on the castle website, so he could keep in touch with fans as far away as Japan and Australia. Now Albert is being replaced by Barney, another lively parrot who is just as talkative. Every birthday and Christmas Albert received cards from all over the world. Hotel co-owner Clarie Watson said: "Albert was so talkative and, because he had been here for 17 years, people got used to seeing him. "There was always a few friendly chirps and words for guests, and over the years he built up a fan club among local people and visitors from overseas. "He got fanmail and Christmas greetings from the USA and around the world." When Albert's owners retired, they decided they missed him, and so now he has also retired from the hotel and gone to live with them. However, the hotel was contacted by someone who was having difficulty looking after their parrot, and he is now on the perch once occupied by Albert. Mr Swaine said: "That parrot is Barney, and he is an blue-fronted Amazonian, the same as Albert. "However, he is actually more talkative because whereas Albert used to prefer talking to children, Barney will talk to everyone." Pretty Polly - or is it Peter?